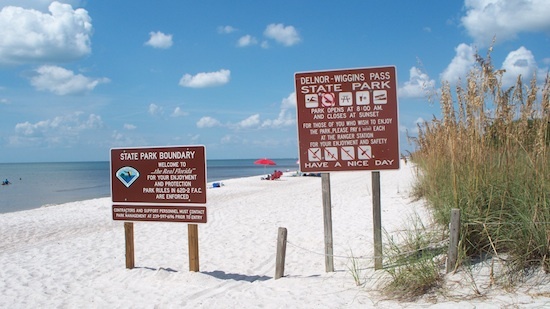 Officially Wiggins Pass beach in Naples Florida is called Delnor Wiggins Pass State Park. You get to it by following Immokalee Road west, past US 41, towards the beach. On your way there you'll pass a small bridge and this sign stating the park's status. It's open from 8 a.m. to sunset. 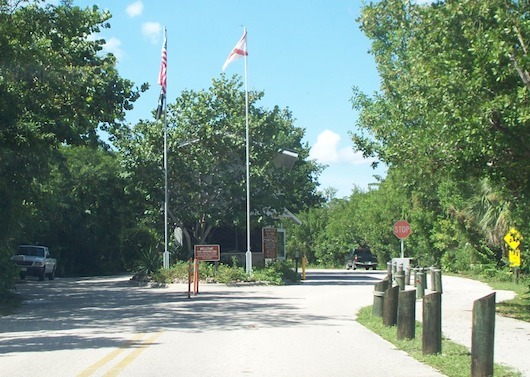 There is a park entrance fee to get in which includes access for the entire day. There is plenty of parking at this 166 acre park. There are picnic tables all over and you can go fishing, swimming, sunbathing, and boating. If you have a boat you can launch it into Water Turkey Bay. Kayakers are also welcome to explore. At the north end of the park there is a tower you can get on so you can catch a bird's eye view of the surroundings. Throughout the park there are showers and restroom facilities. This beach is usually quiet because there's plenty of space. Some locals buy yearly access to it, especially boat owners because it's a great place to launch. 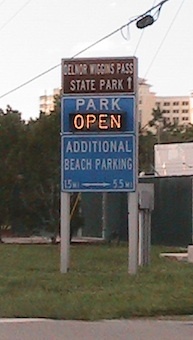 Here's a photo of the beach right where the State Park line begins. Here's a video that I made on the way to the park one day. Enjoy!